RUSKIN — The Lennard Longhorns boys basketball team finally vanquished the swarming Spoto Spartans to win 68-67 last Friday Nov. 30. Longhorns Donato Blue, #10 white, works for a shot in the paint while #21 David Flannery jockeys for rebounding position against Spoto. Spoto came out running and pressing, forcing Longhorn turnovers and missed shots as the smaller visitors jumped out 18-12 over coach Zarko Stojakovich’s Cows in the first quarter and pushed the Spoto lead up to 32-25 by halftime. After a strategy session at the intermission led by Stojakovich and his assistant Courtney Ruffin, Lennard found the net offensively in the third quarter and catapulted to a 51-48 lead. The hustling Spoto squad, led by coach Augustine “Danny” Gaddis, kept it a one-basket game until the final horn. Spoto went to Lithia Dec. 4 with a 2-1 record to face Newsome. The Spartans’ games this week also include Armwood at Seffner on Dec. 5 and then a match-up with Jefferson at Spoto on Dec.7 before heading to Tampa to play Jesuit on Dec. 11. The Spoto head coach is Danny Gaddis, legendary and much-revered in Ruskin for leading the Lennard Longhorns to one of its finest seasons ever back in 2014. His teams still reflect his scrappy, intense style without too much height but a lot of fight. 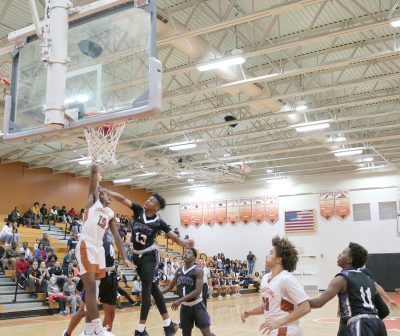 Lennard brought a 2-0 record into a pair of mid-week games with Jefferson at Tampa Dec. 4 and at home against Strawberry Crest Dec. 5 before facing powerful Plant City Friday, Dec. 7, in the Longhorns’ corral at Ruskin at 6:30. Lennard actually lost its regular season opener on the road against Durant but Durant was forced to forfeit to Lennard for using an ineligible player. In the back and forth Spoto game, it took awhile for Lennard to solve the tenacious play of the Spartans. 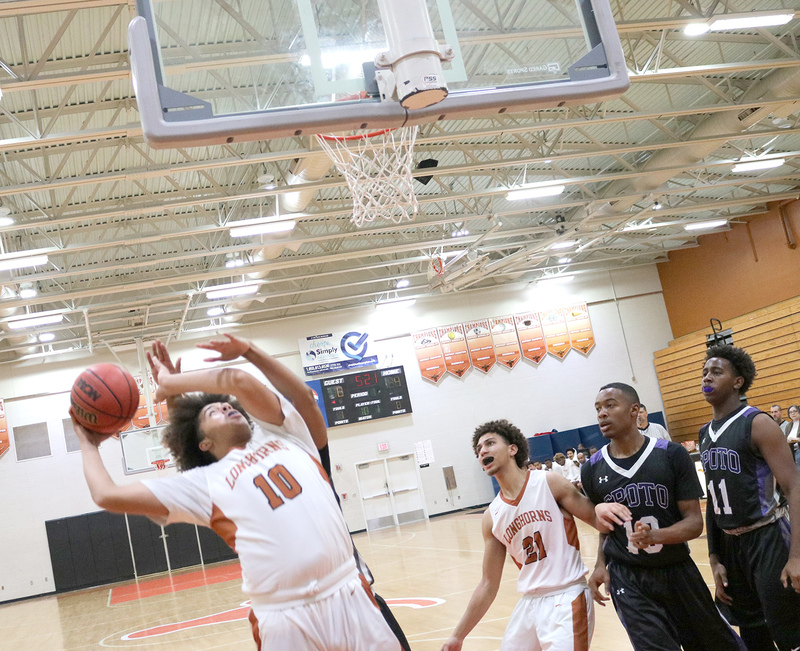 Lennard’s Jayden Lacey, #15 white, goes strong to the hoop against Spoto’s #13 Raheim Thomspon Jr. The second year head coach observed that “we lost a lot of games last year in late-game situations. This year we made sure to make those close-game losses a great emphasis in practice. “We are glad we pulled it out,” said Stojakovich, in an understatement, wiping his brow after the game. Sojakovich had praise for the performance of big Maurice Pickett II. The biggest player on the Longhorn squad at 6 foot, 3 inches and 225 pounds, the senior forward was a perfect 5 of 5 shooting from the floor and added 3 of 3 from the free-throw line to tally 13 points. Pickett also dominated on the boards, grabbing 10 rebounds. Other key Lennard contributors statistic-wise in the overall team win were senior Rae’Shaun Wilson with 21 points, 3 rebounds, and 2 assists; junior Jayden Lacey scored 11, had 4 rebounds and 4 assists; senior Aaron Jensen notched 7 points and 6 rebounds; and junior CJ Peterson chipped in with 13 points, 6 rebounds, 3 assists, and 4 steals.